INJAZ Bahrain, in cooperation with AlMabarrah AlKhalifia Foundation (MKF), has launched a one-day “Innovation camp” workshop at Bahrain Petroleum Company – Bapco. 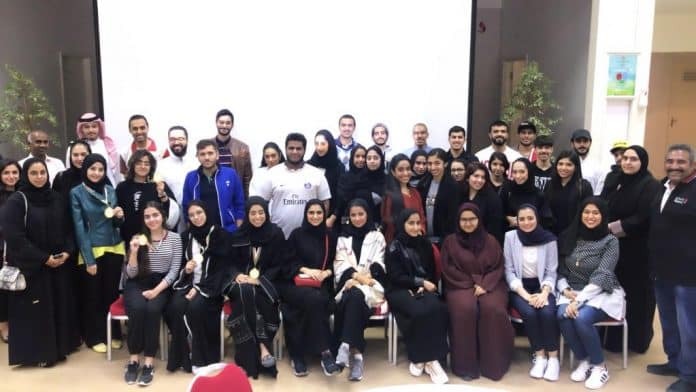 The workshop attended by both students and graduates, aimed to encourage students to foster an understanding of entrepreneurship by creating innovative solutions to challenges from the real business world. Designed to fit the needs of students in preparing them for business challenges, the workshop tested the students on a variety of skills including: leadership, analytical thinking and presentation skills in addition to learning how to start a business. Students divided into teams, participated in a set of educational activities and recreational games as well as business challenges for which they had to find creative solutions given a specific time frame and limited resources. The workshop laid emphasis on developing students’ personal skills, as well as acquiring new skills, including problem solving and working within a defined time frame. Mrs. Saba Seyadi, Executive Director of AlMabarrah Alkhalifia Foundation commented “We are very proud of any initiatives that encourage students to take a more creative approach in all aspects of their lives and to gain entrepreneurial skills. That is why we would like to extend our appreciation to INJAZ Bahrain for organizing this workshop. We also look forward to collaborating with other organisations to launch initiatives that benefit Bahrain’s youth. The ICamp workshop comes in line with MKF’s efforts to build a fruitful partnership with INJAZ Bahrain, providing training and growth opportunities for AlMabarrah AlKhalifia students. The workshop helps students gain both practical experience and market knowledge expanding their horizons and preparing them for an entrepreneurial future. INJAZ Bahrain programs are offered by hundreds of volunteers from across the private sector institutions every year. Over the past 14 years, more than 200,000 students benefited from the 19 programs that the organization offers.